Spanning three generations, this novel of family and myth is told through a series of flashbacks that depict events of staggering horror set against a landscape of gemlike beauty as the Chinese battle both the Japanese invaders and each other in the turbulent 1930s. As the novel opens, a group of villagers, led by Commander Yu, the narrator’s grandfather, prepare to attack the advancing Japanese. 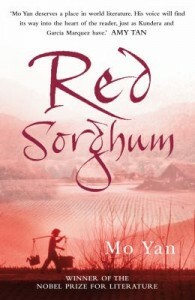 Yu sends his 14-year-old son back home to get food for his men; but as Yu’s wife returns through the sorghum fields with the food, the Japanese start firing and she is killed. Her death becomes the thread that links the past to the present and the narrator moves back and forth recording the war’s progress, the fighting between the Chinese warlords and his family’s history. Only 2 readers in the group actually finished the book and they found the book well-written and intriguing. The different values systems displayed by the different warring sides highlighted the inhuman character of war. The novel is written objectively, almost distantly, yet is very graphic, especially in depicting death. It was a heavy read. The red sorghum analogy was overdone. In the beginning, the description of a strong woman contributing to her family and culture was interesting an seems very progressive. The sense of survival of all the characters is amazing. Most readers felt the book was well-written and deserving of the Nobel Prize for literature. Most readers found the graphic horror too off putting to finish reading the book. This entry was posted in Awards & Prize Lists, Fiction, Recommended Reading and tagged Book Club, book review, books, Parramatta City Library, reading by admin. Bookmark the permalink.